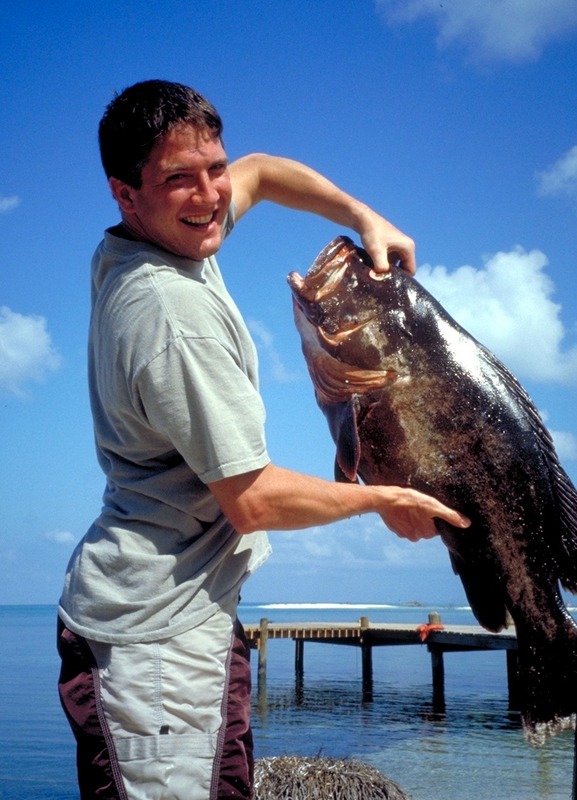 Belize fishing is famous among avid anglers. And Glover’s Reef is the best of the best. Although Slickrock’s program focuses on Belize diving, sea kayaking, snorkeling packages, surfing, and windsurfing, avid fishermen will not be disappointed! 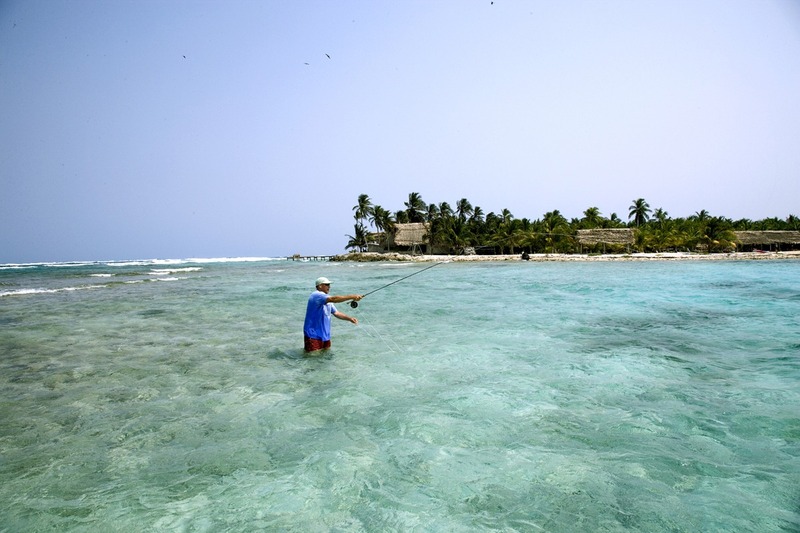 Our island is surrounded by a National Marine Reserve, and as a result, the fish populations are the healthiest in Belize (according to the National Fisheries Department). All fishing is catch-and-release only, and sport fishermen will be rewarded with non-stop action! The only exception to the catch-and-release rule are Lionfish. They are an invasive species and everyone is encouraged to spear as many as they can. We provide the spear guns or you can bring your own. We have a fleet of fishing kayaks. See kayak fishing on a separate page. Fishing from our island is not available without purchasing a private island vacation from us. Our island is located far out to sea, which is one of the reasons it is such a fabulous place; we experience none of the crowding found in other parts of Belize. There is no way to visit our island only for the day, a 5-night package (3 nights on the island) is our minimum as our private boat charter only goes to and from the island two days a week. Packages include hotels and meals in Belize City before and after the trip, transport to and from the island, accommodations and meals on the island, soda and beer on the island, your Belize fishing license, and windsurf and other sports gear and instruction. 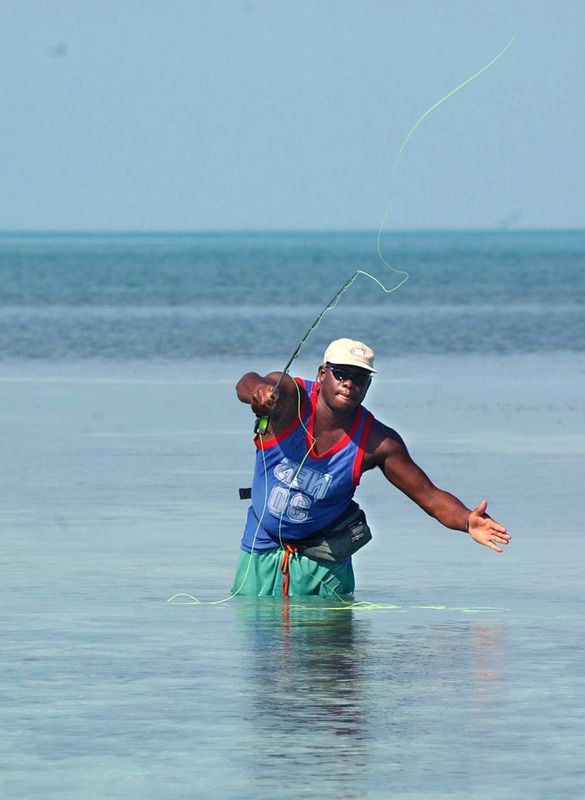 We specialize in Belize multisport trips; we aren’t just a fishing resort! 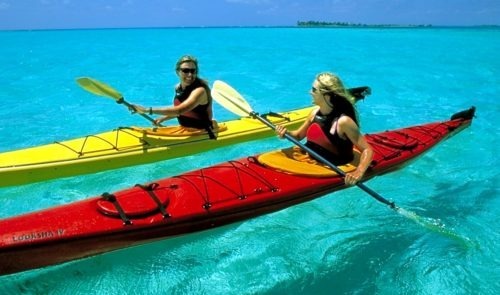 For a complete summary of all the sea sports we offer, visit our adventure sports page. “I could see a dark mass thirty feet from shore in about four feet of water. Elmo said ‘there they are’ and it was only then I realized I wasn’t looking at weed. I was seeing 300 bonefish schooling in the incoming tidal flat pools at the edge of Glover’s Reef. Later when I put on my snorkel and mask, I had the thrill of watching these sleek, chrome-green fish splinter and ricochet past me within arms length. They regrouped and slid across the flats, seeking the food that the tide would bring. There is no need to hire a guide, you just wade in and fish! The fishing is excellent just off our island; in fact professional fishing guides charging $350/day regularly bring their guests over 35 miles by boat just to fish a few feet from our shore for a few hours. But you can fish there anytime you want! What Time of Year is Best for Bonefishing? The fly fishing is always good! 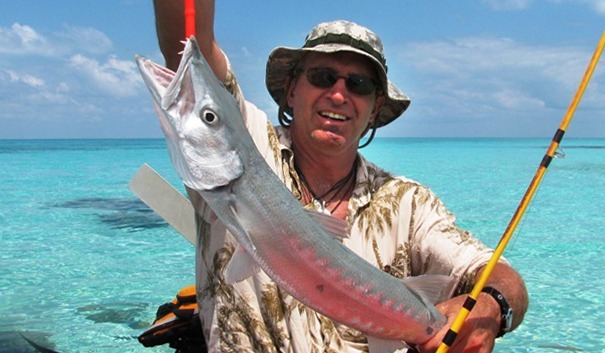 And the fishing at nearby Middle Caye is EXCELLENT. We often paddle down to fish there. All you need is a buddy. 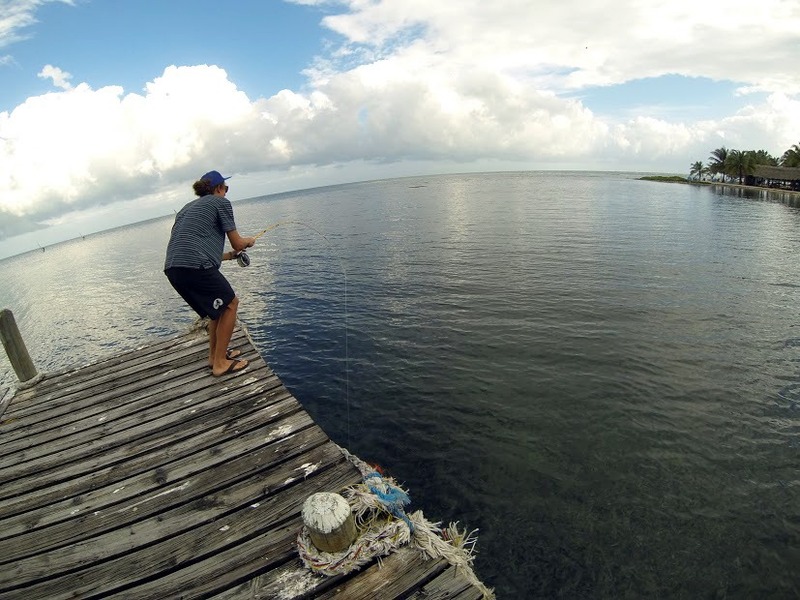 What About a Belize Fishing License? Glovers Reef Atoll Belize is a National Marine Reserve and it is catch-and-release only for guests. Sport fishing at Glover’s Reef requires a license. We buy it for you! You can begin to fish right away, the ranger shows up days later and we pay for your license at that time. 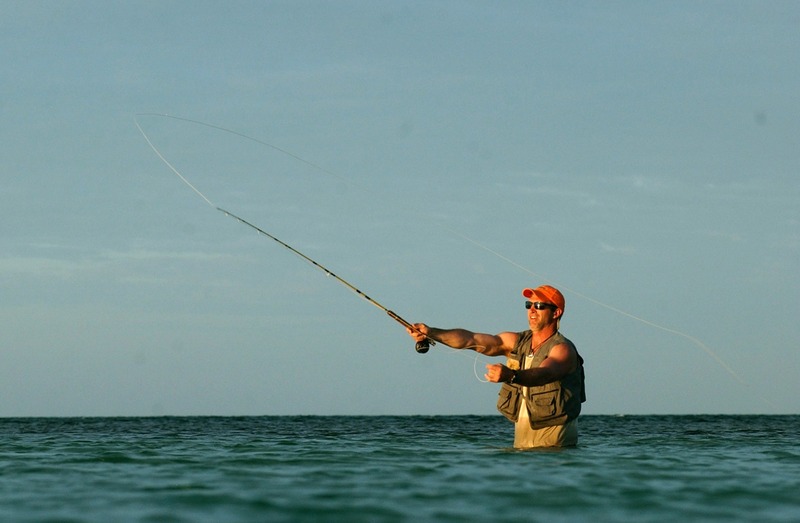 Most guests focus on fly fishing for bonefish and permit, however those who spincast will pull in more fish. Our waters abound with jack, barracuda, and snapper which readily take spinners. If you don’t have fly fishing gear you can use your spin-casting equipment for fly fishing, and here’s how to do it. If you are using a collapsible spin-casting rod you will need a clear float bobber that you fill with water. This gives the line weight and gives you the ability to do longer casts with a short pole. After the bobber you attach a swivel which stops the bobber from traveling down the line toward the fly. After the swivel you tie on a tippet, then the fly. A 7-foot tippet is best. With this set-up the fly sinks to the bottom, and with a Crazy Charlie, it looks like a shrimp. Bonefish don’t go for lures, only flies. What do fishermen need to bring? We do not provide fishing tackle, only fishing kayaks, so we are often asked what sport fishermen should bring for the conditions surrounding our island. Our island has a variety of bottom conditions that require different tackle to attract the fish being sought after. 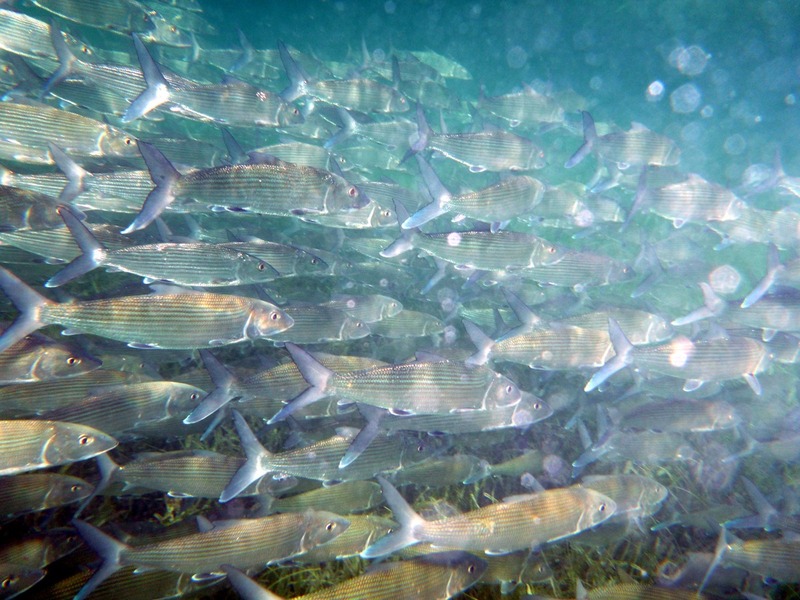 There is a deeper bay (6-15’ deep) right off our primary beach, and a large school of bonefish live there. Heavier flies work better in this zone, and we most often use the fishing kayaks to stalk the school in this area. Wading is very easy on the flats near our shore and more challenging on the reef edge. 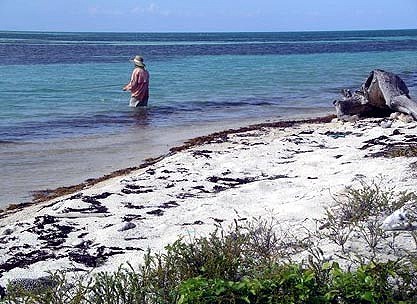 The west end of the island and prime fishing areas on nearby islands have shallower sand flat zones with turtle grass coverage where solitary bonefish are often found. These tend to be the larger bonefish (cruisers), and a lighter fly works better in these areas. The areas of transition between the turtle grass and sand flats are generally the best areas to find these larger, solitary bonefish. There are also areas on the windward side of the island where you can cast into the surf zone, either into coral reefs or rubble shoals, where jack and snapper, as well as reef fish, are more easily caught. Bring a lot of lures because they often get caught on coral or lost to big fish. Crazy Charlie flies are by far the most successful flies used to land bonefish in our area, so bring a plentiful supply of both light and heavy flies of this type. Brown Bitters, Snapping Shrimp, Foam crabs, McCrabs, and bring several tippets would be a good selection to round out your collection. Fishermen have had good luck with pinks, whites, browns, and greens, with combinations used depending on the bottom color. There is no single ‘magic’ color or size that will be perfect, it will be necessary to adapt to the conditions and the location you are fishing from at the time. Bring an 8 weight fly rod, 9’ in length, with a marine floating line with 10-15 lb leaders. For a reel use any saltwater compatible with plenty of backing (200+ feet.) Also, remember to bring polarized sunglasses and ankle high booties for wading (many stinging hydroids and occasional urchins hide in the sea grass). Be sure to read Randall Kaufman’s “Bonefishing With a Fly”, especially chapters on retrieve, hooking and landing. We do see quite a few permit in the surf zone and shoals off the point of our island. These fish are notoriously skittish and very hard to get close enough to for casting. They are not a seasonal fish so anytime is right to find them, although they are not present everyday and one should never count on finding them on any particular week. Permit spook easily and are very particular about what they strike, so finding the right crab pattern for your fly is difficult. Have a tan, green, and brown pattern available. Fishermen can wade into these zones to get close to the fish, wading in right off the island’s shore. 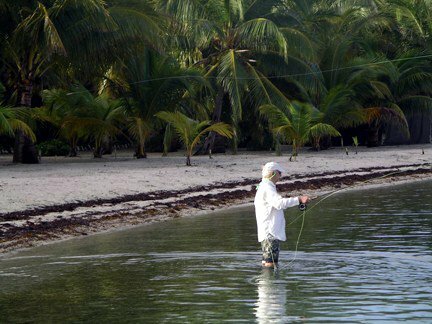 Overall, the fishing at Long Caye is more about spotting fish, figuring out their feeding patterns, and exploring terrain. Of course good presentation and casting action is important, but the actual fly used is probably less important than these other aspects. You’ve got to find the fish first, and there is a lot of terrain to explore. Some days will be exemplary, some days you’ll get skunked, and as we all know luck is the primary factor in a successful fishing outing! 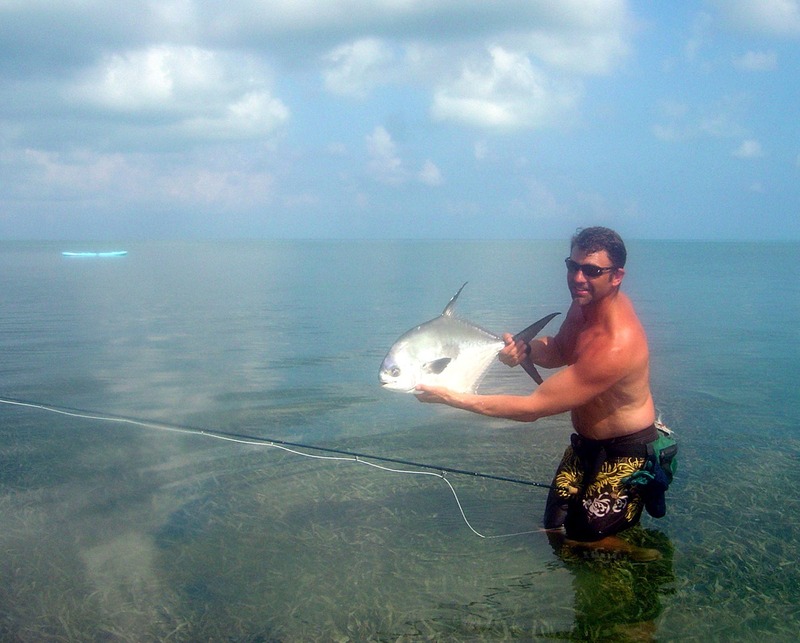 If you’re coming to Belize specifically to find a prize winning permit, for instance, our advice would be to go to a fishing lodge and hire a professional guide who will take you right to the fish you end up catching, at a cost of $350/day. If you want to explore and improve your skills in spotting fish without a lot of other fishermen around, our place is perfect for you. For even more discussion about Belize bonefishing visit the Ambergriscaye.com fishing page. Can I Troll From a Kayak? We rarely host fishermen who use our kayaks for trolling outside the reef. There are a few reasons for this. 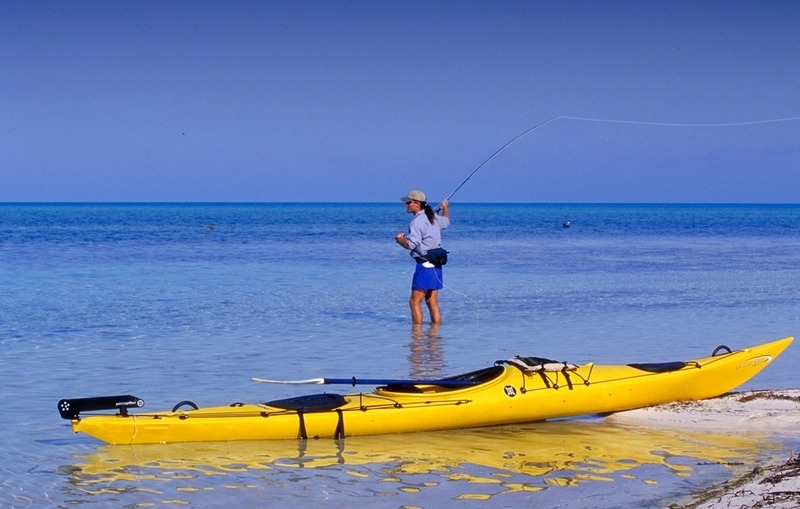 Our fishermen all fly fish or spin cast either by wading in, fishing from the dock, or fishing in the shallows from an anchored fishing kayak. One reason is that no one should use the kayaks without a buddy (another person in a 2nd kayak, joining you) unless they are right trolling near the island. The area outside the atoll is often too rough to kayak at at all, with or without a guide. Occasionally conditions can permit you to fish outside if a guide accompanies you. However, since our guides are guiding everyone, not just the two fishermen, there may not be many or any times you could actually go outside during a week on the island. This would depend on the weather and the size of the group. Obviously if there were only 4 or 6 people on the trip the guide would have a lot more time to join you outside than if there were 20. We can’t predict in advance how many people might sign up for the trip date you choose. It is possible, however, to troll inside the atoll on a much more regular basis. The fish you could catch inside (where it is much much more calm) are: amber jack, barracuda, permit, bonefish, snapper, horse eyed jacks and yellow tail jacks. I’ve been an avid fly fisherman for more than 50 years, tying all of my own flies and building some of my own rods. In many fishing articles I’ve read that die-hard fishermen like myself are searching world-wide to hook and land bonefish. A few of the lucky ones get a few, mostly in the 2-5 pound range. 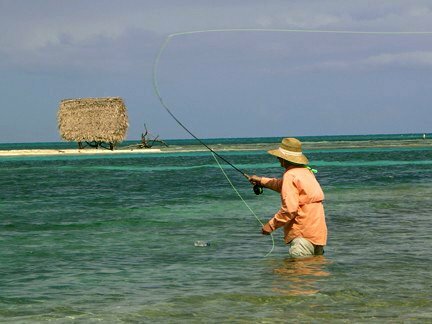 On Long Caye in two days I hooked five and landed four, all on flies I made. It took a half hour to land the last one and 20 minutes for the other three. All five bonefish took out all 90 yards of my fly line plus backing on their 3-5, 100-140 yard, 4-5 second runs. If they didn’t turn at the end of those screaming runs, you’d never stop them. All four I landed were too large to lift up onto the dock, so I was forced to beach them. The last one, being over 27″ long, was so big I couldn’t get both my hands around it. I was forced to straddle it between my knees and hold it by a gill plate to carefully remove the fly. 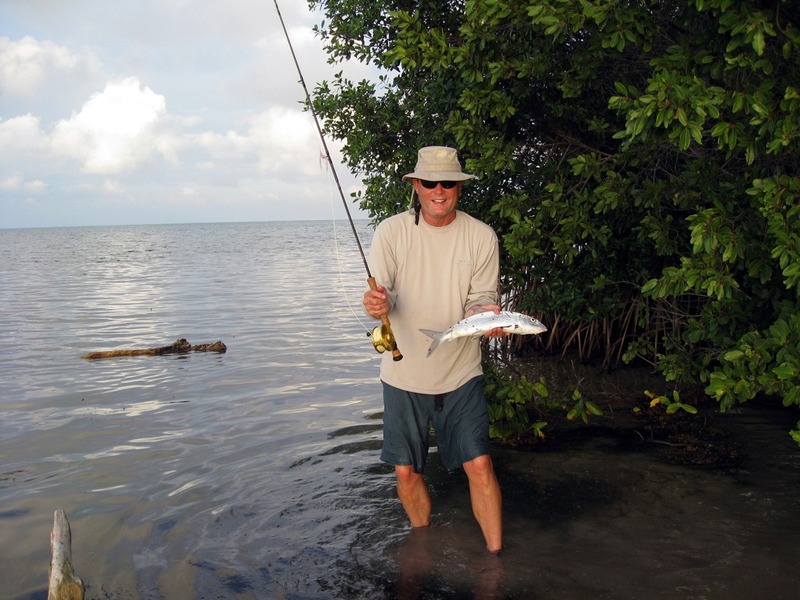 Pound for pound no fish in fresh or saltwater comes close to the fun of landing a bonefish. They have great heart and are relentless. Cully was standing next to me as I was beaching the first one I hooked. He ran to get a camera. Suddenly the bonefish took off again for about 100 yards into deep water. Then nothing. I brought the line back to find only a head and gill covers on my hook. Almost the entire body had been severed clean by a 4-1/2 to 5 foot long barracuda that Cully said had been hanging out in the lagoon recently. Guess what– two fish later the exact same thing happened again. I retrieved a head with no body. Cully couldn’t believe it. Those four days of fishing were the best I’ve spent anywhere. One of the greatest things was that I never needed any kind of boat. All fishing was done from the dock, shallow wading or from the beach which was only 200 steps from our cabana. I caught probably 10 to 12 different species in the four days I fished. I caught 27 fish in the last two hours of the final afternoon alone. I had a fish on almost every cast. All wonderful fighters, including one huge bar jack that almost equaled the bonefish. What a trip! I didn’t get a chance to experience the fishing kayaks, but they certainly promise a much greater range to the already great fishing at Slickrock.